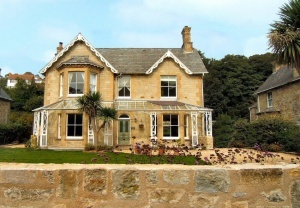 Built of island stone in 1876, this handsome property is situated on Park Avenue overlooking Ventnor抯 beautiful park. 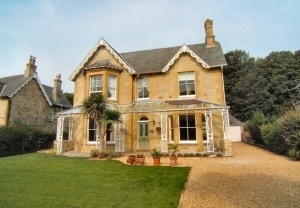 Melville Lodge was at one time the vicarage for St. Catherine抯 church and is the epitome of the grand Victorian villa. In the last three years the current owners have lovingly restored this period property, sparing no expense and retuning Melville Lodge to its former glory - notably cleaning the original island stone and re-pointing the entire building with natural lime mortar. 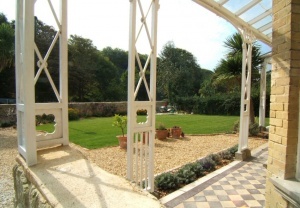 The verandah to the front with its decorative woodwork and glass canopy frames the architecture of building, linking the house to the terrace and lawn. There are large bay windows, original sashes and detailed fretwork under the eaves which creates a balance with the delicate design of the verandah below. The interior is equally elegant with high ceilings, restored ornate cornicing, ceiling roses, deep skirtings and a wealth of marble and cast iron fireplaces. The d閏or has been brought up to date with stripped and polished floorboards and a simple clean colour palate which allows the craftsmanship of the original features to speak for themselves. The current owners have opened up one side of the ground floor to create a 35ft kitchen-dining room and there are two further large reception rooms and a further sitting room on the ground floor. Upstairs, there are six bedrooms in total - four (one en-suite) and a family bathroom lead off the lofty and ample main landing and two further double bedrooms lead off the half landing. An additional living room, shower room serve these bedrooms to the back of the house which also has a utility room on the ground floor. 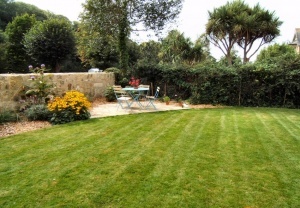 Outside, gardens with terracing, lawns and exotic planting surround the property and there is a large driveway and separate garage. ENTRANCE HALL: 20�x 7�br />An imposing entrance hall with staircase to first floor, stripped wooden floor and all previously mentioned original features. Doors off to all downstairs rooms of the main house, radiator. LIVING ROOM: 20�x 15�br />Large bay with sash windows to front with views across the lawn, large marble fireplace with tiled hearth and currently housing a Vermont Castings multi-fuel burning stove. Cornice, ceiling rose and two radiators. KITCHEN-DINING ROOM: 34�(into bay) x 14�br />Large bay with sash windows to front with views across the lawn, sash window to rear and two further sash windows to side. Marble fireplace with slate hearth, three radiators. Stripped floor and LED down-lights. 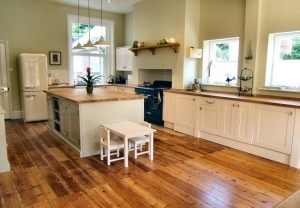 A fitted kitchen with large bespoke central island unit and a range of base, wall and glazed units. 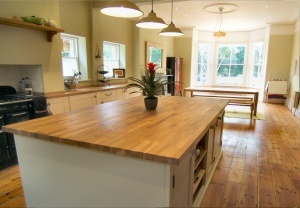 Oak work-tops and tiled splash-backs. Large bespoke fitted dresser. Chimney breast with tiled surround, extractor fan and space and power for a large range style cooker. Belfast sink with mixer tap, built-in washing machine and dishwasher. Cupboard housing Worcester boiler. Door to rear lobby with dimpled glazed back door to rear garden. 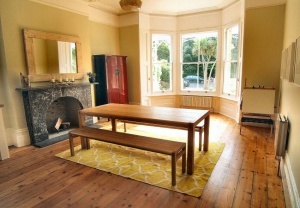 SITTING-DINING ROOM: 14� x 10�br />Two sash windows looking out to the rear garden. Radiator. Plenty of space for dining table and chairs. UTILITY ROOM: 9�x 7�br />Sash window to rear garden. A range of base and wall units, granite effect work-tops and tiled splash-backs. Space and power for fridge. 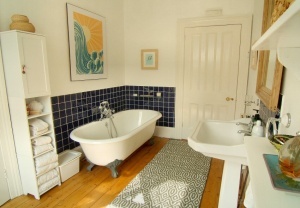 With exposed floorboards and fitted with w.c. and wall-mounted wash hand basin with tiled surrounds. Opaque window to the rear. 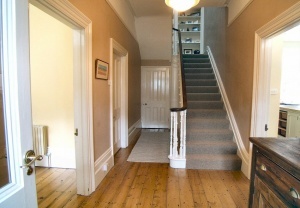 From further hall, stairs up to FIRST FLOOR with under-stair utility cupboard. 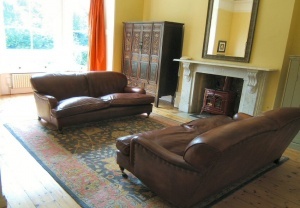 RECEPTION THREE/FORMAL DINING ROOM: 18�x 14�br />Another large bay to side with sash windows. Picture rail, ceiling rose, cast iron fireplace and two radiators. Pedestal wash hand basin, low level w.c., radiator and access to extensive cellar. Comprising three rooms - i) 19� x 14� approximately ii) 10�x 6�iii) 20�x 14�All rooms enjoy full head height. 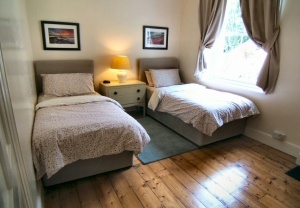 TWO DOUBLE BEDROOMS (5 & 6) AND SHOWER ROOM to the rear of the house. 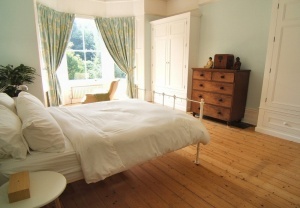 BEDROOM FIVE: 14�x 9�br />Sash window to rear with garden views, wash hand basin, radiator. 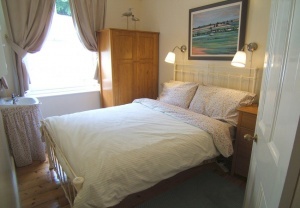 BEDROOM SIX: 10�x 7�br />Sash window to rear with garden views, wash hand basin, radiator. Fully tiled with glass brick 憌indow� to side aspect. MAIN FIRST FLOOR LANDING: 19�x 7�br />With original stained glass skylight window with natural light from further Velux window in attic space above, radiator and doors to four bedrooms and family bathroom. 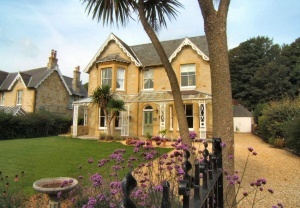 MASTER BEDROOM EN-SUITE: 20�(into bay) x 14�br />Sash window to front overlooking the garden and park beyond. Stripped wooden floorboards, radiator. 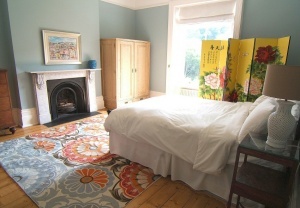 BEDROOM TWO: 15� x 14�br />Stripped wooden floorboards, marble fireplace with cast iron insert. Radiator. 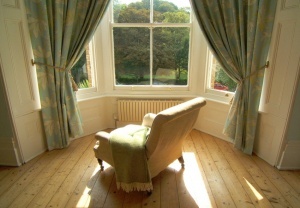 Large sash window to side, cast iron fireplace, radiator. BEDROOM FOUR: 14�x 7�br />Sash window to rear, built-in cupboards, radiator. 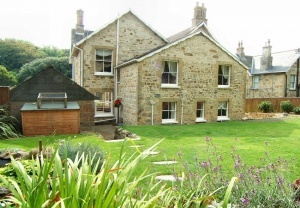 BATHROOM: 10�x 6�br />Sash window to side, claw footed free-standing bath with mixer taps, low level w.c. Radiator. Pedestal wash hand basin. 5) Internal square footage measurements are approximate and do not include hallways, bathroom/shower rooms or WCS.